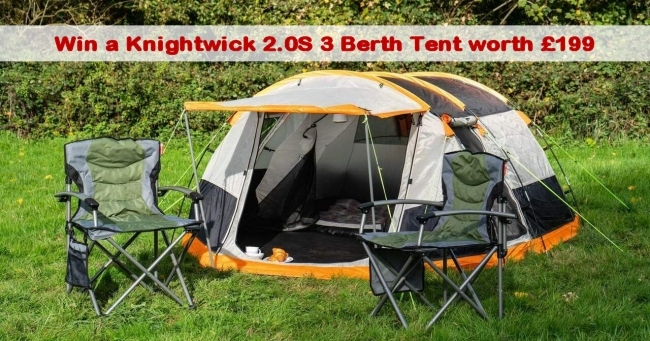 The OLPRO Knightwick 3 is a compact tent, with enough room for three people and bags. It packs down small, is spacious inside, keeps you dry, and is well ventilated. The Knightwick is Black, Grey and Orange so if you're using it at a festival it's great to stand out from the usual sea of green and blue tents. It is quick to pitch - it should take 10 -15 minutes to put up and you pitch the flysheet first so that the inside living area never gets wet. It is fully waterproof to 5,000mm and is fully taped throughout, and comes with a 10,000mm HH Polyethylene Groundsheet. In real terms this means the tent can hold 5 metres of water before if even thinks about leaking. You are going to stay dry what ever the Great British Outdoors throw at you. The tent is 130cm tall, so not tall enough to stand up in but the living area gives enough room for four people sit in. The Porch area also has a separate groundsheet which means it's easy to take out and clean - on site or at home. For extra ventilation the two doors have mesh fly screens so you can sit in the tent with it fully enclosed but with ventilation on one or both sides. It also has a rear mesh vent with cover and windows on both sides so the tent can be as light or as enclosed as you need it to be. Sitting in the Knightwick you can see everything around you or remain fully enclosed! It is supplied with set of canopy poles which can be used on either doorway to give you a great canopy to sit under. This is great for sunny days or after a long day walking or biking when you can put up the canopy and sit outside in the shade. All in all, a great tent for smaller families or couples, or for festival goers, which packs down to just 60cm long x 19cm deep x 23cm high. We have teamed up with OLPRO and are offering you the chance to win a Knightwick 3 Berth Tent! For further details and for your chance to win click here - Competition now closed! 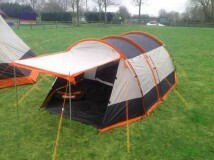 You'll also find reviews of OLPRO Tents, and photos uploaded by owners in our Tent Showcase. If you own a OLPRO tent, please let us know what you think of it, by leaving your own review.